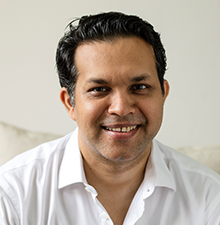 Aman Narain is the Chief Executive of Bank Bazaar International, India’s leading financial website backed by Amazon, Fidelity Growth Partners & Sequoia. In his previous role, he was the Global Head of Digital Banking for Standard Chartered. In Standard Chartered, Aman transformed a set of subscale channels into one of the largest digital real estates serving over 10 million people in 35 markets. He accomplished this in six years working with an award-winning, global team of 600 people who he recruited and developed. In 2011, Aman was recognised as one of the eight global leaders changing Banking and Technology and had since pioneered a number of industry firsts across Social Media, Mobile Banking and Payments. These have resulted in multiple industry accolades including two Webby Awards and being recognised as the “World’s Best Internet Bank” for three years running by the Global Finance Magazine. Aman is passionate about Business, Technology and Design. He is an avid blogger on www.amanwhoblogs.com. He is a strong advocate of diversity in the workplace, having built a gender-balanced leadership team that has pioneered a progressive work culture and collaborated with the Singapore Government on community firsts including the “Mobile Ventures Fellowship (MoVe)” for Singapore graduates and “Silver Lining” which bridges the digital divide for senior citizens. Aman graduated with honours in International Relations & Economics from Ohio Wesleyan University. He is also an MBA from INSEAD.